If you stare lovingly at your bookshelves as often as I do, why not make them beautiful? 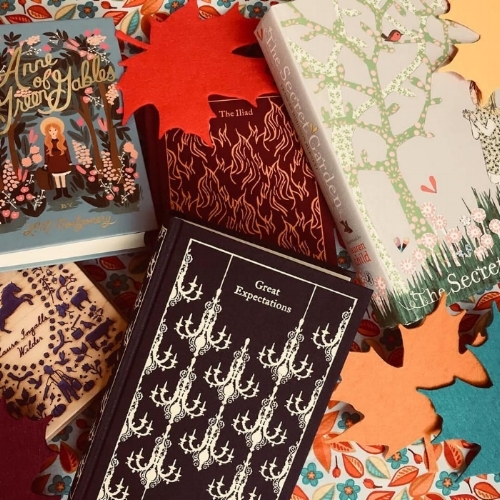 Check out these stunning editions of our favorite classics that look like fall! This beautiful copy of The Iliad from Penguin’s Clothbound Classics series captures the fiery intensity of seasonal change. The reds and oranges mimic autumn colors, while capturing the heat of Georgia Octobers. Another from the Penguin Clothbound series (there will be several on here - they’re just so cozy! ), this copy of Hound of the Baskervilles makes me feel like I’m wrapped in a sweater drinking hot tea. Plus, mysteries are always a great match for that thrilling and mysterious fall feeling. This is the last one, I promise! I love the idea of a deep blue for fall - there is something about the cool, calm thoughtfulness of the season that this edition of Great Expectations (also from the Penguin Clothbound series) captures. Fall is for long conversations, and who better to have a long conversation with than Dickens? I wish I could show every page of this beautiful edition of Song of Myself. Each page is full of stunning illustrations and words that swirl like leaves in the wind. 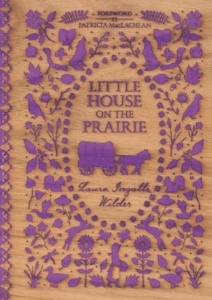 If you love the outdoors in autumn, these editions of the Little House on the Prairie series are for you. The covers feature designs etched into the wood of trees regional to predominant settings in each novel. This is another hit from Penguin - this time, the Puffin in Bloom series with Rifle Paper Co. I love this edition because it conveys the hues of fall and all its somber notes without subduing the whimsy and excitement of the season. If these books tickle your fall fancy, I have good news!